If you are in to garlic, then you have to try this mustard. It offers a uniquely robust flavor thanks to the addition of garlic and champagne. It is a rich, high quality mustard with no artificial ingredients or preservatives. Fresh roasted garlic, and real champagne go into the mix to create this popular flavor of mustard. It goes great with a variety of dishes, and delivers a flavor that truly enhances any food you use it on. Liven up any of your favorite foods with this great gourmet mustard. It is made by hand daily using only fresh, all natural ingredients. Naples Valley Brand Mustard tastes amazing and is intensely flavorful. It is excellent on hot dogs and sandwiches, but you can also use it to glaze ham, as a tasty dip for pretzels and so much more. This is the perfect gift for all those mustard lovers out there, but makes a great addition to any fridge. This is the garlic variety mustard, but we also carry the hot version too. Click here for details. Choose a healthier mustard with outstanding flavor. 10 oz. Uses hot dogs, sandwiches, as a dip, as a glaze, etc. Ingredients sugar, whole shell eggs, garlic, vinegar, dry mustard, champagne, spices. 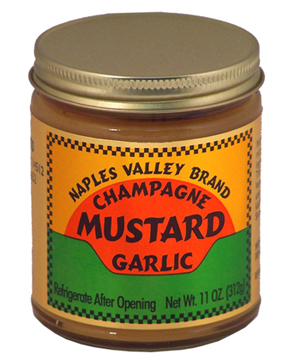 Naples Valley Brand Champagne Garlic Mustard - Hand crafted for an irresistible gourmet taste. This all natural mustard will greatly enhance all kinds of food. The perfect addition to any refrigerator, and also a great gift for all those mustard lovers out there. Haven't opened a jar yet but as one jar broke in transit I can say the the mustard sure smells good.